These days it is harder and harder to get a free pass to a classical music concert in Moscow. The underlying reason for that is a new cultural policy of Russia which goes along with the statement that museums should bring in an income. However, there are still some places where you can enjoy the art of a Russian pianist school for free. 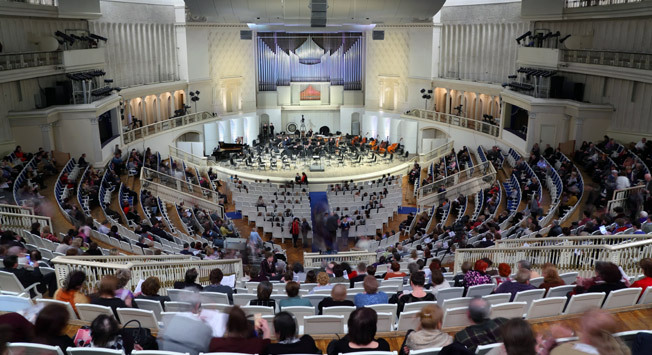 A higher musical university in Moscow offers a great variety of concert programs. A lot of them have free entrance in the Small Hall and Rakhmaninovsky Hall, so it is an opportunity of a lifetime to get acquainted with incredible Russian musicians in the historical building where Sergei Rachmaninoff and Alexander Scriabin studied. It is possible to visit the International organ and violin or wind and percussion music festivals. Most of all, these concerts are conducted by young musicians who support their teachers' classes. Despite their age, they give highly professional performances. Address: Bolshaya Nikitskaya street, 13/6. Musical and pedagogical institution of higher education in Moscow invites music fans to its students' concerts. Young musicians play the violin, double bass, piano with choral arrangements as well as using wind and percussion instruments. The Gnesins college also has a concert hall where students carry out performing practice. Concerts are held in the evening on weekdays and in the morning at the weekends. The visit is totally free. In some of the museums there are special programs, directed to popularize classical music. You pay only for entrance to the museum and the concert itself is free. It goes without saying that the museum ticket is nothing (about 100-200 rubles) in comparison to the price of a ticket to a concert performed by Moscow Conservatory or Moscow Philharmonic Society. You can visit professional chamber music concerts about twice a month in the Library of history of Russian philosophy and culture - A. Losev house (Losev was a Russian philosopher, philologist and culturologist who lived in the 20th century). However, before visiting it is important to register in order to participate in all of the library’s events. Piano concerts take place in M.A.Bulgakov's museum (Bulgakov was a Russian writer, best known for his novel The Master and Margarita). The society of classical music fans organized the museum event and invite everyone to come and enjoy classical music, 20th century music or jazz in the mysterious atmosphere of Bulgakov's house. Address: Bolshaya Sadovaya St, 10. About twice a month piano concerts are held in the museum of Russian poet Marina Tsvetaeva. If you are eager to listen to the music you will need to pay an entrance fee of around 100-200 rubles. However, every third Sunday of month the museum has free entrance for all visitors. Address: Borisoglebsky Lane, 6, p. 1. One of the few preserved city estates of the 18th century established an Opera Club that offers music concerts by masters of the arts and young performers, as well as festivals and opera singing competitions. The Museum of Alexander Goldenweiser (pianist, composer, rector of the Moscow conservatory) arranges different piano concerts of classical music and modernist music of the 20th century. Moscow Philharmonic Society presents a new project - Virtual Philarmonic Society. On the website you can watch online broadcasts from every event at home for free. And though the recording of a concert cannot compare to the atmosphere of a concert hall, it will help you to feel part of the musical events in Russia and of course enjoy the charming music.